Today in "headlines I never thought I'd write." Host: I bet you the Sedins room together. Seguin: Well yeah. That's the Sedins. Benn: Who knows what else they do together, too. Host: Dude, it's creepy. in fact, it's a good example to future brothers in the NHL on how not to do things. In my opinion. Other host: Are they weird? Benn: I don't know. I can't say. Other host: You do know. Seguin: They look funny. They look weird. Benn and Seguin were largely following the leads of the hosts here. Still, hockey's not great with reflexive homophobia, and we've been down this exact same road with the Sedins before, with Dave Bolland's comments in 2011. So the Stars couldn't let this go. 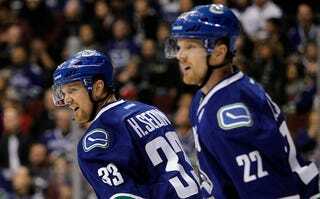 "Jamie Benn has reached out to Henrik and Daniel Sedin to apologize for the radio interview that he was a part of on Monday. The Dallas Stars have the utmost respect for the contributions that the two have made to both the game and to their community over the course of their great careers. We will not be commenting on the situation further." Now if we could only get across to people that it's not automatically funny or insulting to refer them the "Sedin sisters," as Bill Simmons did just last month.